Scotland would be in budget surplus to the tune of more than £800m with a "geographical share" of North Sea revenues, government figures suggest. However, if the country was to receive its per capita share of North Sea revenues in line with the rest of the UK, it would have a deficit of £6bn. Excluding North Sea revenues entirely would leave deficit of £6.7bn. The figures are contained in the Government Expenditure and Revenue in Scotland (Gers) report. The report compares government spending with the amount of money raised. Experts from Aberdeen University said a geographical share of North Sea oil revenues would give Scotland 83% of the revenues. That would give the country a budget surplus of £837m (0.7% of GDP) in 2006/07 - compared with a UK deficit of £4.3bn. Finance Secretary John Swinney said the report showed Scotland was in surplus. "The flow of resources from Scotland to the rest of the UK is some £1.2bn," he said. "This year's Gers publication has been informed by an updated and detailed analysis of North Sea revenues by Aberdeen University, enabling a geographical share to be allocated to Scotland's accounts. "Indeed, as North Sea oil revenues soar, city accountancy firm Grant Thornton estimates that Scotland's surplus would now stand at some £4.4bn." 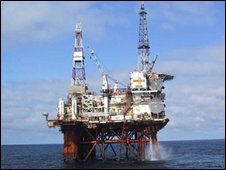 Total non-North Sea public sector revenue in Scotland was estimated at £42.4bn in 2006/07, compared with expenditure of £49.9bn. The figures were produced by government officials, but ministers were not involved in the process. Officials said the figures were the most accurate picture yet of Scotland's fiscal position, with more than 3,000 budget lines having been queried with the Treasury since the last figures were produced. The SNP's Treasury spokesman at Westminster, Stewart Hosie, said the report was "game, set and match" for the economics of independence. "Whilst even Gers shows Scotland would be in a far healthier financial position than the UK as a whole, it is clear that the flow of resources is from Scotland to the rest of the UK, not the other way round," he said. "The SNP have long known that Scotland could flourish as an independent country, now Gers shows that Scotland would be a prosperous nation with a budget surplus." But Tory finance spokesman Derek Brownlee voiced reservations about the SNP's position. "As a fuel crisis sweeps the globe, the SNP is trying to build the case for independence on the volatile price and diminishing supply of oil," he said. "The SNP seems to be highly selective in its crystal ball gazing - for example the accompanying study only runs until 2013 and ignores the North Sea oil decommissioning costs, which might well produce much smaller or even negative oil tax revenues in later years." A Treasury spokesman said the department took issue with "various aspects" of the methodology used in the report. He added: "These figures illustrate how important it is for Scotland's economic health to stay within the United Kingdom. "It would be economically damaging for Scotland to become fiscally dependent on North Sea oil and gas receipts given the huge volatility of oil and gas prices, and that production has declined by 42% since 1999 and is forecasted to keep declining by around 5% a year." Does Scotland get its fair share?